Peavey Electronics and Agile Partners have announced that the AmpKit and AmpKit+ Apps are available now on the Apple iTunes App Store. The apps are described as "the ultimate iPhone amp and effects studios with extensive recording and re-amping capabilities". 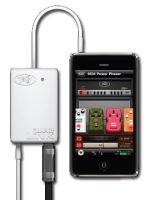 AmpKit and AmpKit+, together with AmpKit LiNK, an electric guitar interface for iPad, iPhone and second- and third-generation iPod touch. AmpKit is a free app that includes the Peavey ValveKing amp with clean and high gain lead channels, two ValveKing cabinets (4x12 and 1x12), two pedals (Noise Gate, Elevenizer), two mics (Workhorse 57 dynamic mic, Germann 87 condenser mic), and a built-in Noise & Feedback Filter. AmpKit+ is a paid app that includes three additional amps, four more cabinets and eight additional pedals, at less than half their individual prices. The additional amps include the Peavey 3120 amp with clean, rhythm, and ultra-high-gain lead channels and matching 4x12 cabinet, the Colonel Vintage amp paired with matching 4x10 and 1x12 cabinets, and the Vintage Brit amp with matching 2x12 cabinet. The additional pedals include 10-band EQ, distortion, fuzz, compressor, chorus, phaser, flanger, and reverb effects. With both apps, AmpKit's Gear Store enables In-App Purchasing of additional amps, pedals, and mics, up to a total of 12 amps with 20 amp channels, 13 cabinets, 16 pedals, and 8 microphones. AmpKit's amp, cabinet, and pedal simulations are modeled based on real-world equipment. Because the AmpKit LiNK guitar interface includes special features to reduce feedback when listening through headphones, AmpKit is designed to simulate amps such as the Peavey ValveKing and 6505+. AmpKit includes recording capabilities and creates both "dry" (guitar signal before effects are applied) and "wet" (guitar signal with effects applied) recordings. This enables another AmpKit feature: re-amping, where you can take a recording and re-record it using a different amp and pedal setup. Once you've made a recording, you can upload it to your computer, email it to a friend, or post it directly to SoundCloud. AmpKit has been optimized for the iOS platform. It operates on any iPhone, including the first 2G model, as well as both second- and third-generation iPod touch devices. AmpKit can support a dozen or more simultaneous pedals, according to the company, depending on configuration. Latency is said to be low. AmpKit leverages iOS 4 and iPhone 4 capabilities, with gear images optimized for the Retina Display and support for Fast App Switching. AmpKit includes over 60 predefined amp/pedal setups, and users can create and save a number of their own setups. AmpKit includes the same tuner and metronome technology used in GuitarToolkit, and both are visible from the setup screen, with no need to switch screens. AmpKit provides a web interface for uploading backing tracks to play along with, uploading dry guitar audio for re-amping, and downloading recordings. 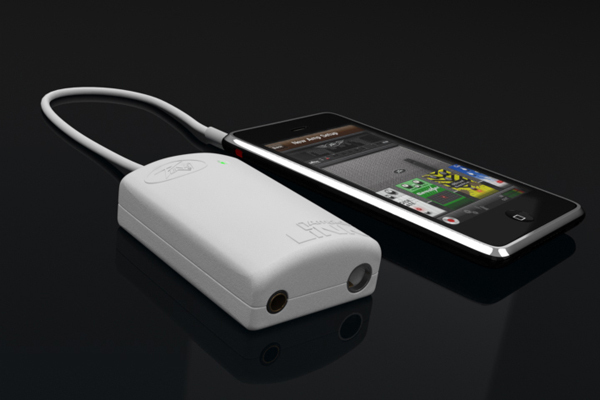 AmpKit LiNK is an interface for plugging an electric guitar, bass or other instrument directly into the headphone jack of an iPad, iPhone and iPod touch. It is a companion to AmpKit: because of special crosstalk reduction circuitry that is applied when using headphones, AmpKit LiNK is designed to make it possible for AmpKit to reproduce the high-gain tone of amplifiers such as the Peavey 6505+ without excessive feedback. Connects to iPhone, iPod touch and iPad via 1/8-inch cable, automatically detected by iOS when plugged in. 1/4-inch mono input jack for electric guitar, bass, and line level signal sources, preserves full signal fidelity. 1/8-inch stereo output jack for connecting headphones, powered speaker, or PA system - works with most recording, processing and tuning apps, including GuitarToolkit. 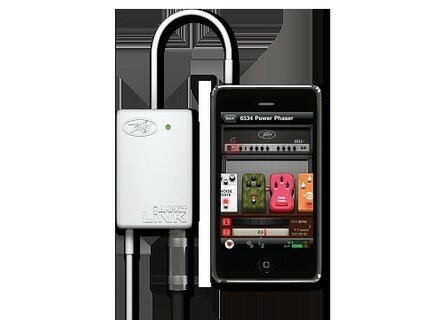 Compatible with all iPhone models, both second- and third-generation iPod touch devices and iPad. The AmpKit and AmpKit+ Apps are available for free and $19.99, respectively from the App Store on iPad, iPhone and iPod touch, or at itunes.com/appstore. 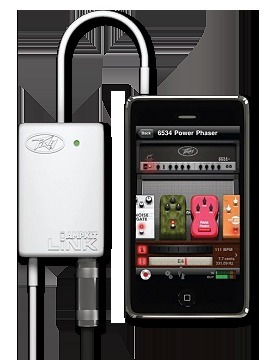 AmpKit LiNK is available for $39.99 from Peavey retailers and distributors worldwide. A list of current AmpKit link retailers is available at peavey.com/ampkitlink. AmpKit is the latest guitar app from Agile Partners, the developers of the GuitarToolkit and the TabToolkit. For more information, visit ampkitapp.com.